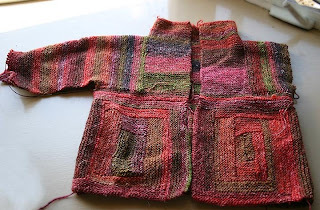 Work on my February Lady's Sweater is progressing. 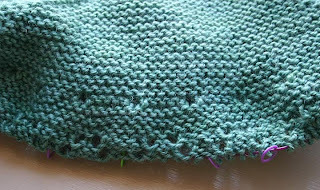 I'm past the garter stitch top and about 2 repeats into the gull-lace bottom. 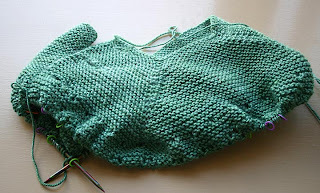 I love how this sweater looks when it's done - so feminine and graceful. (Check out the 5,887 other Feb Lady sweaters on Ravelry.) This isn't a difficult knit but I do have to pay attention now that I'm on the lace - definitely don't want to rip it back to fix a mistake. I'm alternating work on the Lady sweater with my Cozy Jacket. This is straight garter stitch, so it's pretty mindless. I'm almost done with the first sleeve, which leaves just the second sleeve, button bands and bottom trim. Hoping to have this done in time to wear in the fall . . . of this year. 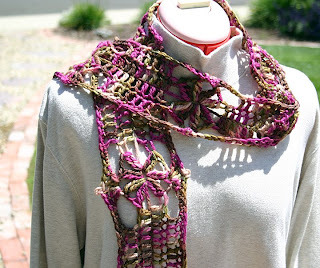 I had an idea for a crocheted scarf - I ripped out a stalled project and repurposed the Lorna's Laces yarn into a scarf I'm calling 'Picot Flower'. Pattern should be up on Ravelry (and on my sidebar) later tonight.